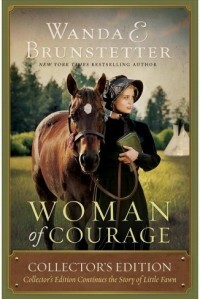 “Woman of Courage” has been on my reading list for a few years now, and I am glad that I was able to read this collector’s edition, which includes the sequel novella “Woman of Hope.” Expecting “Woman of Courage” to be a travel novel and an Oregon Trail-like experience, I was surprised to discover that it fell more into the genre of wilderness survival and mountain living. Traveling was still a part of the tale, but most of the narrative was focused on the characters’ experiences and interactions with each other rather than on the trek itself. Fraught with omnipresent danger, this story did not have any lulls or tedious sections and proved to be a quick read, even taking into consideration the appended novella. The situations seemed realistic and not contrived, and there were several twists that I did not expect, which I always appreciate. Amanda, the eponymous heroine, was a sweet character, and I would have liked to have more of her background; other than being unerringly Christian and using quaint language (“thee” and “thou”), there were no other indications that she was a Quaker. It would have been worthwhile to add more information about this particular religious group to the story, in my opinion. However, I did appreciate the author’s use of Native American and mixed-race characters. Despite very much enjoying this story, there were a few points with which I had issues, and I wavered between a four and a five-star rating. Some of the language and slang used in the narrative was not period-appropriate, and several of the characters were stereotypical, including Amanda. She was too perfect and therefore did not seem to grow or change throughout the course of the story, whereas Jim Breck’s attitudes and place in the story shifted too quickly. Yellow Bird and Buck McFadden were my favorite characters, as they were the most dynamic and realistic, given their pasts and what became of them. Because Amanda was a missionary, the Christian underpinning of the novel did come across as preachy, but not overbearingly so. Amanda’s story dovetailed well into that of Little Fawn’s in “Woman of Hope”, and this novella is what ultimately bumped up my rating. Little Fawn’s story was not as idealistic and yet it was still hopeful and inspiring. Amanda’s character was also more realistic, and all of the characters’ actions were credible. The story was well written for its short length, as well, and it did not seem like it was too abrupt. Being able to see how circumstances changed for the characters from “Woman of Courage” in the approximately seventeen-year time gap and being introduced to the next generation of characters was a fitting way to end the saga.